True story: when I first visited the Stonehenge Memorial at the Maryhill Museum of Art in Washington State, I didn’t know it was an imitation. I usually attribute my ignorance to my age at the time and my upbringing in a rural area in the dark ages before the Internet, but even with those allowances, you’d think I would’ve learned at some point in grade school that Stonehenge was at Avebury on Salisbury Plain. * Luckily, I was smart enough to keep my mouth shut on the way to Maryhill, where the signage explained that the monument was a replica. There are so many Stonehenge replicas in the world, some more accurate than other. Of the less accurate but more entertaining variety, Carhenge is probably the most famous. I’ve managed to drive through the State (uh, Official Commonwealth) of Virginia several times without ever stopping at Foamhenge. And, no, I wasn’t at Glastonbury in 2007 to see the construction of Banksy’s Loohenge. More interesting to me are the models that attempt to establish some relationship between the architecture and astronomy. 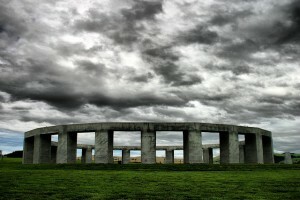 Although the sentiment behind the Maryhill Stonehenge was misplaced, as a structure, it is carefully designed and well-built, with the altar stone aligned with the sunrise at the summer solstice. Similarly, although Stonehenge Aotearoa was built at a similar scale to the structure at Salisbury, it was aligned for the southern skies. For example, the heel stones of the henge mark the rise and set points of the sun at the midsummer and midwinter solstices, and the autumn and spring equinoxes. In addition, a well-placed obelisk points to the celestial south pole, acting as an axis mundi for the night-time visitor. Specific to the Aotearoa site are stone representing the Pleiades, or the “Seven Sisters”. Maori refer to this group of stars as “Matariki” and use its position mark the beginning of a new year in late May/early June. To the south-west of this group of stones stands a single marker stone indicating the location of Matariki’s rise. So, I find the models that attempt to investigate/explain the links between astronomy and architecture more interesting than things like “Butterhenge” or “Peepshenge”. Most interesting of all, however, are the many “real” henges that I only learned about in heritage management courses in graduate school: Woodhenge, Seahenge, the Ring o’ Brodgar, Stenness (Orkney); the Thornborough Henges, Yorkshire; the Mayburgh Henge, Cumbria; and many others. They intrigue me for the obvious reasons—what do they mean, who built them, how were they built—but as a historian with a research interest in cultural heritage studies, I also find them interesting test cases for public and state preservation policy. How do you approach the management of a wood henge that has been almost completely eroded by the sea? Who has the right to access the inner circle of Stonehenge? Can you copyright a neolithic stone structure? *By the way, don’t listen to all those people who complain about Stonehenge being a tourist trap and a disappointment just because you can’t touch the stones or buy a decent cup of coffee at the site. Stonehenge is awesome, case closed.